"Not many, if any, children's books on the Middle Ages and castles contain the wealth of information found in this fresh, appealing offering." -- SCHOOL LIBRARY JOURNAL (starred review) What was it really like to live in a castle? 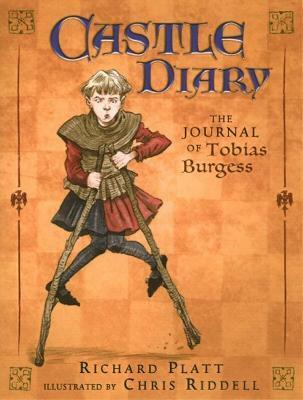 Step back to the Middle Ages with CASTLE DIARY: THE JOURNAL OF TOBIAS BURGESS. Eleven-year-old Toby's vivid diary entries offer an insider's view of day-to-day castle life, including tips on etiquette (where do you spit at a feast?) and exciting descriptions of hunting, jousting, and harvesting. Complete with glossary, index, and detailed endnotes, this is a rich look at medieval life that informs as much as it entertains. Not many, if any, children's books on the Middle Ages and castles contain the wealth of information found in this fresh, appealing offering. --School Library Journal, starred review An informative and amusing introduction to the medieval world. RICHARD PLATT is an avid fan of castles and the author of many innovative and best-selling books for children, including CROSS SECTIONS: CASTLE, illustrated by Stephen Biesty. Chris Riddell is one of the most acclaimed children's book illustrators in the United Kingdom. In addition to his skill as an illustrator, he brings to CASTLE DIARY a wicked sense of humor, perhaps the result of his years as a political cartoonist.